Roast Garlic adds great flavor to any number of dishes, from sauces and dressings to soups and mashed potatoes. And it’s super easy to prepare. Garlic can be rather pungent, particularly when you take it in large doses. I remember in high school when my French teacher took us to an authentic French restaurant. They seemingly specialized in everything garlic. The next day everyone in school could smell my eau de l’ail. No wonder garlic is said to keep vampires away! Now roasted garlic, on the other hand, is a revelation. It’s soft and buttery and almost sweet. 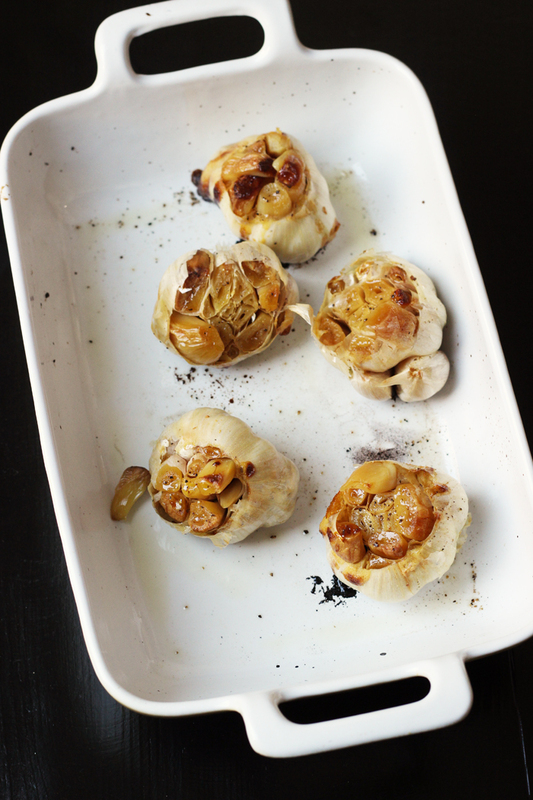 Roasted garlic is a wonderfully flavorful addition to soups, sauces, and dressings. I’ve stirred it into mashed potatoes, blended it into caesar salad dressing, and minced it into cream sauce for pasta. I’ve slathered it on bread for grilled cheese sandwiches and smothered toast with it with baked goat cheese. To put it mildly, I’m a fan of roasted garlic. 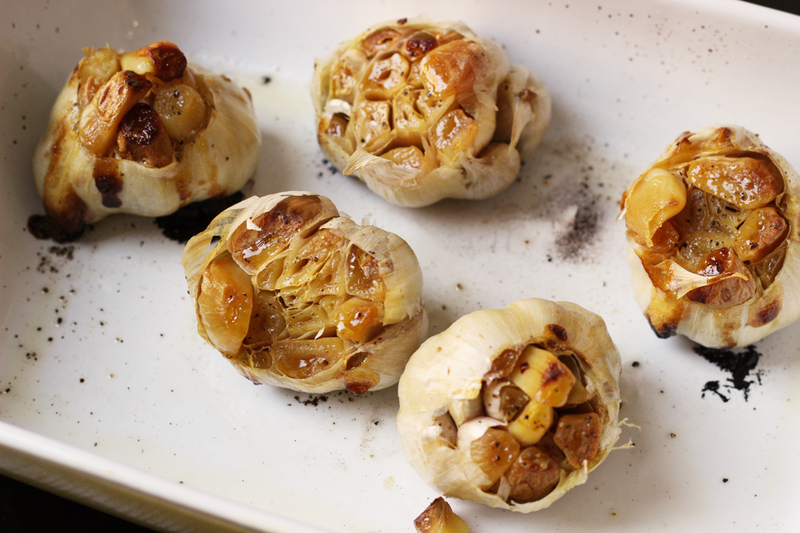 And to top it off, it’s super easy to roast garlic! Today I’m going to show you how to roast garlic en masse. Once you have a batch of this lovely stuff in the fridge, you’ll find no end of uses for it. The process is super simple: cut off the tops of whole head garlic, drizzle in good quality olive oil, sprinkle with black pepper, cover and bake until it practically jumps out of its skin, it’s so happy to see you! When you roast garlic, the flavors mellow, the color browns, and the texture softens to a spreadable texture. It’s great on sandwiches! 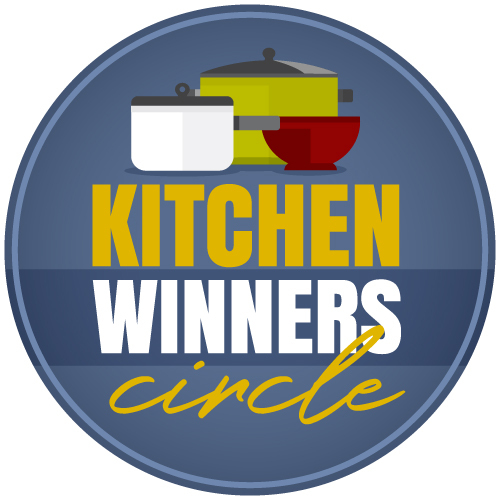 While these recipes don’t call for roasted garlic per se, the caramelized flavor of the roasted garlic will only enhance the flavors of those dishes. Be sure to let me know how you use this very flavorful version of Allium sativum. Roasted Garlic adds great flavor to any number of dishes, from sauces and dressings to soups and mashed potatoes. And it’s super easy to roast garlic. 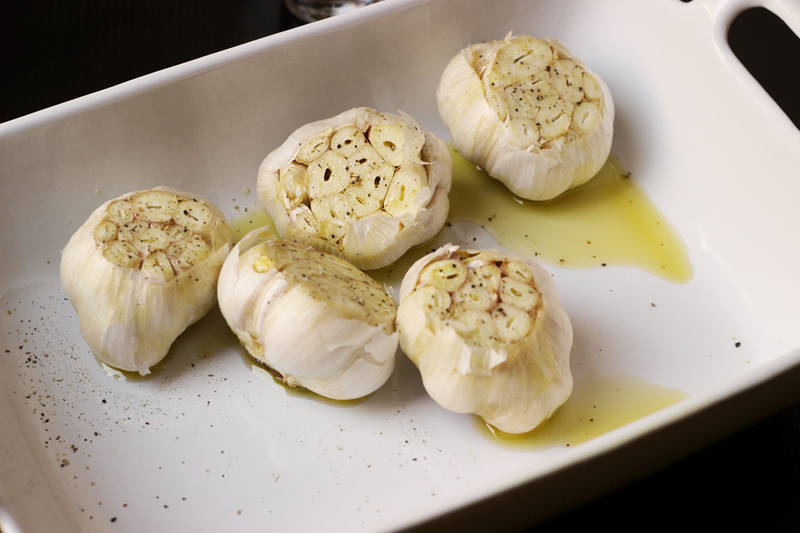 Cut off the tops of the garlic heads so that there is room to pour oil in the crevices. Place the garlic heads cut-side up in a small baking dish. Drizzle the oil into the cut heads of garlic. Sprinkle with freshly ground black pepper. Cover the dish tightly with aluminum foil. Place the dish in the oven and bake for 45 to 60 minutes. The garlic will be golden and browned in bits and practically jump out of its skin. 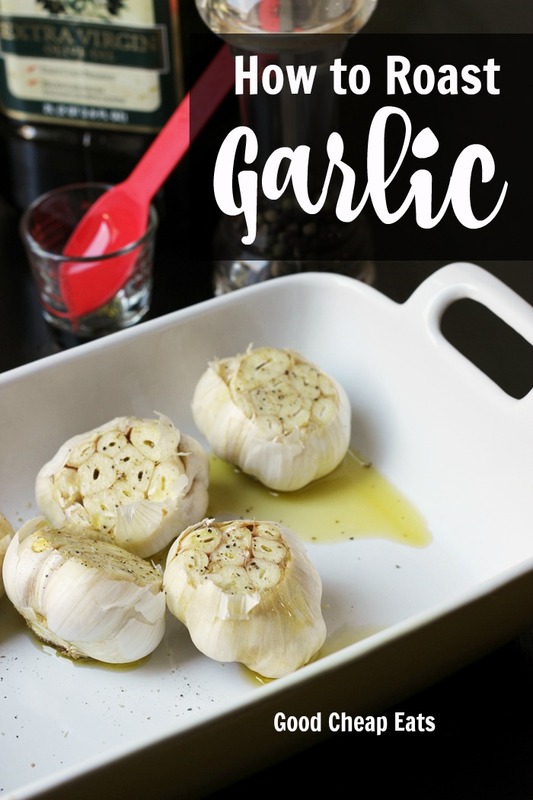 Use the roasted garlic in sauces, soups, dressings, and vegetable dishes. It will have a spreadable texture, making it a delicious addition to sandwiches and toast. 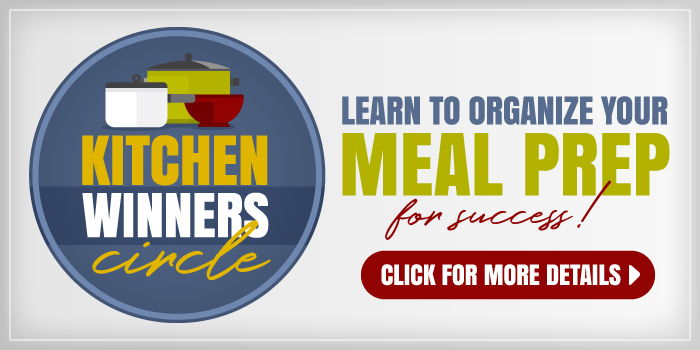 Store leftovers in the refrigerator for up to one week or in the freezer up to a month. Does roasted garlic freeze decently? I know I’ve made it a couple of times and then didn’t use it as much as I thought I would and it got tossed. Do you put it in oil or anything before you freeze it? Good catch. 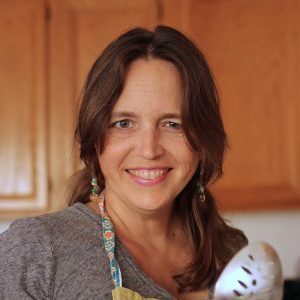 I hand code all the recipes (it’s a technical thing for food blogs) and I use a template. Obviously, forgot to replace all the items on my template. It’s fixed now. Re: Freezing, I would recommend making sure it’s cold and wrapping it airtight. Should be good to go.